Some of the most colourful and eye-catching postcards can be found filed under 'silks' in any postcard dealer's hoard. There are three main kinds - 'wovens', 'printed' and 'embroidered', and it's this last category which is most plentiful and affordable. 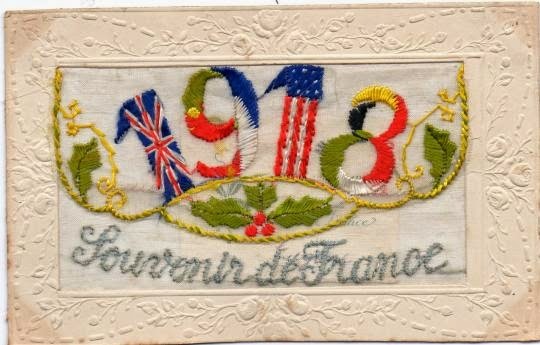 The majority of these glorious embroidered postcards date from the first world war, and were sent from the men fighting in France to their wives, girlfriends, mothers or sister's back home. Many of these cards are unashamedly sentimental, bearing messages such as 'To My Mother', 'To A Good Girl', 'Remember Me', 'May God Bless You Until I Return' and 'To My Dear Wife'. Others are staunchly patriotic - this was an age when people were proud to be British, and the sight of the Union Flag made chests swell with pride. Some cards bear regimental crests, while others, perhaps the most poignant of all, depict soldiers, shell bursts and a message which reads 'Greetings From The Trenches'. When you take into account the heavy loss of men during the war, you can't help wondering whether the sender of the card you're holding managed to return home safely. The amazing thing about these vividly-coloured cards is that they were embroidered by hand. Apparently, they were sewn by French women who were pleased to do their bit for the war effort, and at the same time earn some money. They would have been able to work at the cards between their usual chores, and you can imagine them cramming their embroidery and silks into their apron pockets, ready to work on as they waited for the potatoes to cook or the bread to rise. No doubt groups of women often clustered together to sew, turning it into a sociable occupation, and as the French soldier's rate of pay was lower than the British Tommy's, the extra money would have been useful. The silk embroidery was executed on very fine muslin, which came as a strip approximately six feet long and just under five inches wide. This meant that the same design could be worked along the length about 25 times. When the cards were completed, they were starched to keep the stitches taut, then cut into rectangles and mounted onto a cardboard backing sheet. (These last processes would have been carried out in a factory.) Once mounted, the work measured the standard postcard size of three and a half inches by five and a half. 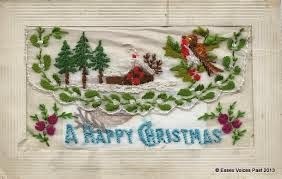 Many of the embroidered cards had the fabric folded into an envelope shape so that a tiny greetings card could be tucked inside. Often, these little cards are still in place, and are printed with a picture or a message. Some of these pictures are very lovely, and are signed by the artist. One of the most popular is Xavier Sager who produced some very delicate work, and has become very collectable in his own right, famed for his postcards of young ladies in various stages of undress! 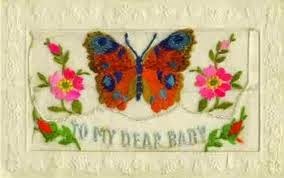 Sometimes, instead of a tiny greetings card, the embroidered shape would contain a silk handkerchief or perhaps a tiny photograph of the sender. The card might even be perfumed. 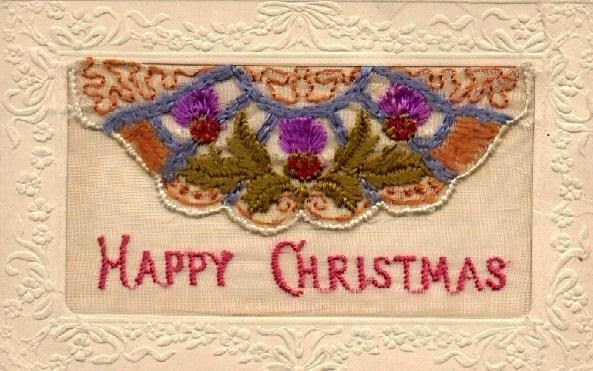 Other embroidered cards were worked upon a flat piece of muslin, and the sender's message would be written on the reverse of the backing board. houses, and are normally sewn in vivid, often garish, shades, which must have greatly appealed to soldiers surrounded by sombre shades of khaki and seas of mud. The cards would be posted inside a translucent envelope to protect the delicate stitching, and would have been treasured by the women back home, relieved to know that their man was safe, at least for the time being. Frequently these cards are passed down through families as heirlooms. Most French women were skilled embroiderers, but some weren't quite so capable, which means that it's possible to find two cards of the same design, one of which is beautiful sewn with dainty stitches while the other has mistakes or clumsy work. It just adds to the charm! Also, even the most accomplished needlewoman would grow bored after sewing the same design 25 times or more, and her attention would wander. 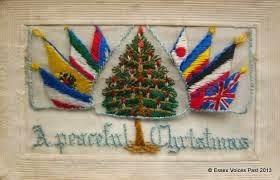 The most complicated work is found in the embroidered badges and flags, and it must have really been a labour of love to sew some of those intricate designs. After all, no one would mind a misplaced flower petal - but a wrong motif on a badge, or a mistake in a national flag couldn't be tolerated. 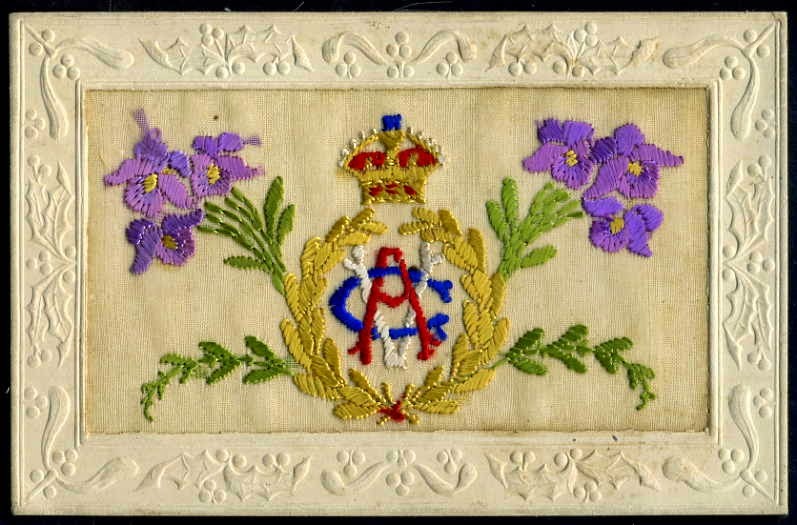 Embroidered silk postcards usually start at around £5 - which is incredible value if you consider all the hard work which went into the piece, and think about the hazards the card might have undergone on its way to England. The cheapest tend to be the sentimental greetings type. 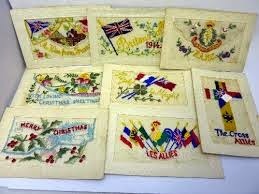 Next are the patriotic cards, full of flags and 'Rule Britannia' or 'We Shall Win' mottoes. 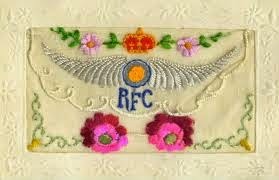 Regimental emblems are dearest of all - they were less popular during the war, as a soldier would obviously prefer to send his wife a pretty card decorated with flowers and lovebirds, than to send her an image of his badge. Woven silk cards are much more expensive. They would have been dearer at the time, too, as they took longer to produce, requiring special looms and a great deal of skill. The most famous producer of these cards was T Stevens of Coventry, whose silk cards are so realistic that they resemble photographs. His range was huge, including flags, ships and clasped hands across the sea. Other manufacturers too produced beautiful cards of flowers, buildings, famous people and a series of 'flames', depicting the burning of cities during the war. Today, woven silks start at £10 but those by Stevens could cost £25- £75 - or even more - depending on condition and subject. Printed silks are slightly cheaper, and they too come in a range of subjects - including flames - as well as regimental designs and various greetings types. 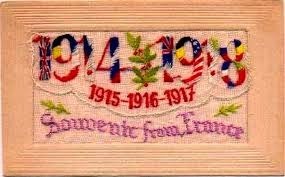 However it's the embroidered cards which first attract most collectors, and a collection of these, kept safely in plastic pockets (acid free) to protect the stitching, is a poignant and colourful reminder of a grim time in our history. A time when sentiment and patriotism weren't regarded as shameful emotions but instead were feelings openly expressed by brave soldiers fighting in the trenches.